Introduction: Gulph Creek is a Schuylkill River tributary located in the region where Chester, Delaware, and Montgomery Counties meet. Gulph Creek is only about six miles long from its head on the Schuylkill River-Delaware River drainage divide to its mouth where the creek flows into the Schuylkill River and drains an area of approximately six square miles. Elevations in the Gulph Creek drainage basin range from more than five hundred feet in hills near the headwaters to less than 40 feet near the Schuylkill River. This relatively small drainage basin has attracted the attention of historians because George Washington and his army camped in the Gulph Creek valley from December 13 to December 19, 1777 before marching on to spend the winter at Valley Forge. However, geomorphologists have ignored the small Gulph Creek drainage basin and several critically important pieces of geomorphic evidence contained within it. Figure 1 illustrates the Gulph Creek drainage basin location west of Philadelphia. Gulph Creek originates at location 1 and flows in an east and east-northeast direction to location 2 where it turns in a north direction to flow through a deep water gap (the “Gulph”) before turning to flow again in an east-northeast direction to join the Schuylkill River at location 3. The southeast oriented Schuylkill River turns in an east-northeast direction downstream from location 3 to flow along the upstream Gulph Creek east-northeast alignment and then turns to flow again in a southeast direction to Bala Cynwd where is turns in a south direction to eventually join the southeast oriented Delaware River south of the map area. Darby Creek is identified with the number 4, Crum Creek with the number 5, and the Delaware River with the number 6. Click on map to enlarge. Gulph Creek originates at an elevation of approximately 410 feet in Strafford and flows in an east direction to enter and flow in a limestone-floored valley that extends in an east-northeast direction to the Schuylkill River. This east-northeast oriented valley is bounded by ridges of erosion resistant metamorphic rocks rising to more than four hundred feet, yet rather than continuing in an east-northeast direction between these high ridges, Gulph Creek makes an abrupt turn to the north and flows through a narrow 200-foot plus deep water gap, known as the “Gulph”, carved across the northern metamorphic rock ridge to reach a second east-northeast oriented limestone-floored valley in which it completes its journey to the Schuylkill River. Southeast Pennsylvania drainage basin origins cannot be explained without an understanding of the Gulph Creek water gap origin. Figure 2: Topographic map illustrating the Gulph Creek drainage basin area (map shows an area about six miles wide). Location 1 is the Gulph Creek head at the east end of the Strafford through valley. 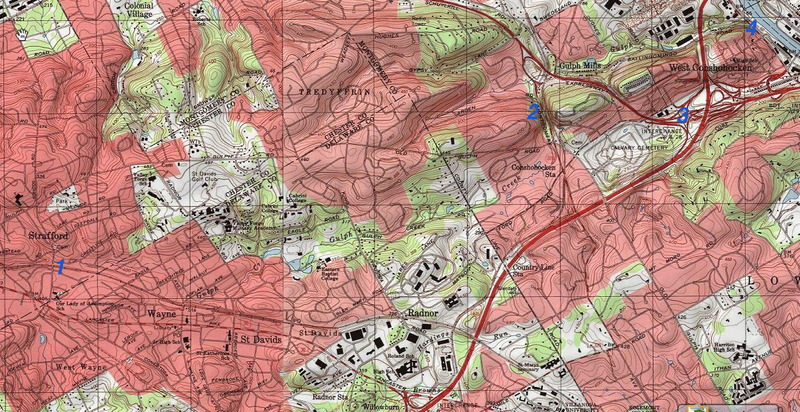 Location 2 is the location of the north oriented Gulph Creek water gap. Location 3 shows the Matsonford through valley linking the Gulph Creek and Schuylkill River valleys. Location 4 near the map northeast corner shows where Gulph Creek enters the Schuylkill River. Click on map to enlarge. Other equally important pieces of geomorphology evidence that must be explained are through valleys crossing drainage divides and linking the Gulph Creek valley with adjacent valleys. The first of the most obvious through valleys can be found near the Strafford railroad station where a shallow through valley crosses the Schuylkill-Delaware River drainage divide and links Gulph Creek headwaters with Little Darby Creek headwaters. The Strafford railroad station is located in this through valley almost precisely on the Schuylkill-Delaware River drainage divide. This through valley, referred to here as the Strafford through valley, was eroded into the erosion resistant bedrock by a significant flow of water that crossed what is now a major drainage divide. 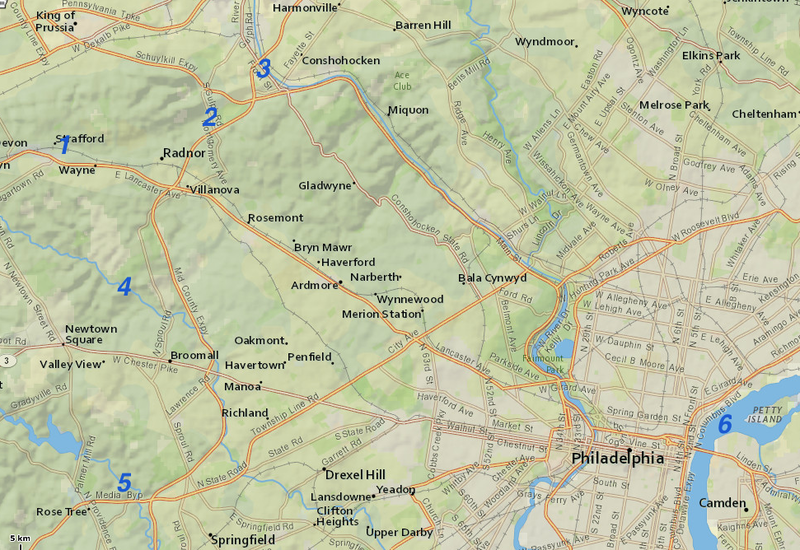 The second obvious through valley links the east-northeast oriented Gulph Creek valley upstream from the Gulf Creek water gap with east-northeast oriented Schuylkill River valley jog. This second through valley, referred to here as the Matsonford through valley, is an east-northeast extension of the limestone-floored valley drained by Gulph Creek upstream from the Gulf Creek water gap. In summary, the Gulph Creek drainage basin, while small in size, contains critical evidence that geomorphologists need to explain. The Stratford through valley: Gulph Creek originates a short distance east of the Strafford rail station and flows in an east direction to reach the southeast oriented Schuylkill River. South of Strafford station are Little Darby Creek headwaters and near Devon Station are headwaters of another Darby Creek tributary. These Darby Creek tributaries flow into the southeast oriented Darby Creek drainage basin, which drains directly to the southwest oriented Delaware River. The Strafford station at an elevation of about 420 feet is located on the drainage divide separating the Gulph and Darby Creek drainage basins, which means it is also located on the Schuylkill-Delaware River drainage divide. Study of figure 3 shows Strafford station to be located in a shallow through valley, perhaps 30-40 feet deep, that crosses the Schuylkill-Delaware River drainage divide and that links the Gulph and Darby Creek valleys. This through valley was eroded into erosion resistant bedrock (primarily schist and gneiss) by what must have been a significant flow of water that crossed what is now a major drainage divide. 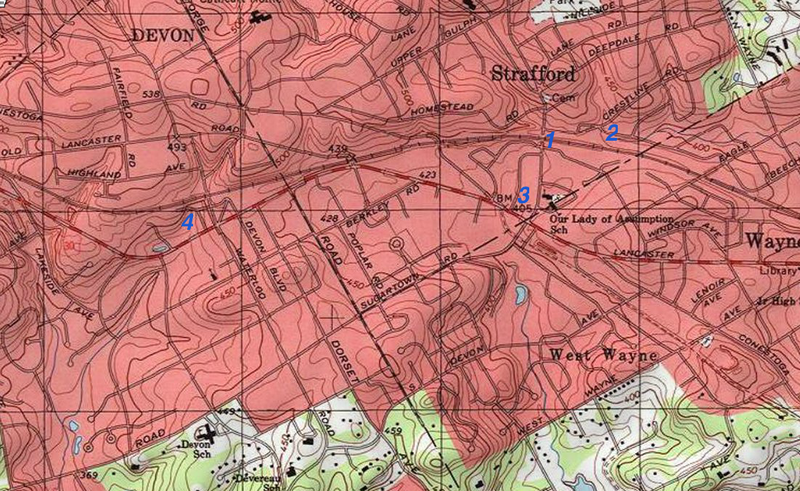 Figure 3: Topographic map illustrating the Strafford through valley area. The contour interval is 10 feet and the map shows an area about 2.5 miles wide. The Strafford railroad station (location 1) is in the through valley and is on the Gulph-Darby Creek drainage divide. Gulph Creek headwaters are at location 2, Little Darby Creek headwaters at location 3, and another Darby Creek tributary headwaters at location 4. Click on map to enlarge. While the Strafford through valley shape and size provides evidence that significant volumes of water once flowed through it, determining the direction of that water flow requires some thought and interpretation. Both the Gulph and Darby Creek headwaters flow into well-defined valleys. Whichever way the water flowed the water had to have moved across what are today deep valleys to reach the through valley. No matter which way the water flowed the Strafford through valley was eroded when the present day Schuylkill-Delaware River drainage divide did not exist and at least some present day stream and river valleys had not yet been eroded. In other words, the Strafford through valley is an important clue that can help in determining how the Schuylkill-Delaware River drainage divide originated and in determining the regional erosion history. Today, the Delaware River flows in a southwest direction from near Trenton, New Jersey to near Wilmington, Delaware and is without question the region’s primary drainage system. The Schuylkill River flows primarily in a southeast direction to reach the southwest oriented Delaware River and all Delaware River tributaries south and west of the Schuylkill River are also southeast or south oriented streams. It is unlikely that east-northeast oriented water flowing on a highland surface roughly parallel to the nearby southwest oriented Delaware River valley eroded what are today southeast and south oriented Delaware River tributary valleys. In other words, water that eroded the Strafford through valley most likely moved in a west-southwest direction from the Gulph Creek drainage basin area and was captured by headward erosion of tributary valleys from the southeast oriented Darby Creek valley, which in turn had eroded headward from the southwest oriented Delaware River valley. Such a flow direction would be consistent with the Delaware River southwest orientation and suggests that massive southwest oriented flood flow across what is today southeast Pennsylvania not only eroded the southwest oriented Delaware River valley, but also the Strafford through valley. The hypothesis of massive southwest oriented flood flow across southeast Pennsylvania also logically suggests southeast oriented Delaware River tributary valleys would have eroded headward in sequence from the southeast to the northeast from an actively eroding (eroding headward in a northeast direction) Delaware River valley head. In other words headward erosion of the southeast oriented Crum Creek valley would have captured the massive southwest oriented flood flow prior to headward erosion of the southeast oriented Darby Creek valley, which would have captured the massive southwest oriented flood flow moving to what was at that time the newly eroded Crum Creek valley. Headward erosion of the southeast and south oriented Schuylkill River valley would have next captured the massive southwest oriented flood flow moving across the present day Schuylkill-Delaware River drainage divide at locations such as the Strafford through valley to reach what was at that time the actively eroding Darby Creek valley. Headward erosion of the Delaware River valley along an immense southwest oriented flood flow route and the headward erosion in sequence from the southwest to the northeast of southeast oriented valleys from that actively eroding deep Delaware River valley across additional massive southwest oriented flood flow routes accounts for many of the southeast Pennsylvania valleys. However, the Gulph Creek valley is oriented in an east-northeast, north, and east-northeast direction and requires further explanation. At the time the Strafford through valley was eroded most if not all of the Gulph Creek drainage basin area had to be at least as high if not higher than the present day Strafford through valley floor. Erosion of the Gulph Creek drainage basin occurred after west-southwest flow in the Strafford through valley had ended and as the Schuylkill-Delaware River drainage divide was being created. In other words, Gulph Creek drainage basin erosion was initiated when headward erosion of a deep southeast oriented Schuylkill River valley began to behead west-southwest oriented flood flow moving to the Darby Creek headwaters area and more specifically to and in the Strafford through valley. Gulph Creek valley erosion occurred in at least two stages, both of which can only be explained if a deep southeast oriented Schuylkill River valley eroded headward across west-southwest oriented flood flow channels. The west-southwest oriented flood flow moving to the Strafford through valley and then to the actively eroding Little Darby Creek valley probably was channeled in a very low gradient flood flow channel that developed along the present day limestone floored east-northeast Gulph Creek alignment (upstream from the Gulph Creek water gap), although at an elevation equal to or slightly higher than the present day Strafford through valley floor elevation. Headward erosion of the deep southeast oriented Schuylkill River valley head (perhaps 200 or more feet deep) beheaded that flood flow channel and also caused a reversal of flow on the east-northeast end of that low gradient high level flood flow channel, so instead of flowing in a west-southwest direction to the Strafford through valley and then to the newly eroded Little Darby Creek valley, water in the flood flow channel began to flow in an east-northeast direction toward the much deeper and actively eroding Schuylkill River valley head. The reversal of flood flow in the newly reversed flood flow channel also involved flood flow that was spilling into the newly reversed flood flow channel from yet to be beheaded (by Schuylkill River valley headward erosion) flood flow channels located further to the north and west. This spillage of flood flow from north and west of the newly reversed flood flow channel helped to erode the 200-foot deep Gulph Creek valley upstream from the Gulph Creek water gap and also its east-northeast extension referred here as the Matsonford through valley. These processes explain how the deep east-northeast oriented valley upstream from the Gulph Creek water gap, the Matsonford through valley, and the Schuylkill River east-northeast jog were initiated, but require west-southwest oriented flood flow to still be moving at elevations of 550 feet or more in the present day Chester Valley area north of the Gulph Creek drainage basin, which means Schuylkill River valley headward erosion had not yet beheaded and reversed what must have been major flood flow routes in that region and that erosion of the Chester Valley had not yet begun. The “Gulph” or the Gulph Creek water gap and Matsonford through valley: The Matsonford through valley is the east-northeast oriented valley linking the east-northeast oriented Gulph Creek valley upstream from the “Gulph” or the Gulph Creek water gap with the east-northeast oriented Schuylkill River valley jog seen in figure 4. This limestone-floored valley is bounded on both the north and the south by 200-300-foot high ridges composed of more erosion resistant metamorphic bedrock. While highway construction has altered the valley floor the original Gulph Creek-Schuylkill River drainage divide appears to have been located near the Gulph Creek end of the valley and to have an elevation slightly lower than 240 feet. Gulph Creek today crosses the 200-foot contour line just west of that divide as it turns in a north direction to enter the Gulph Creek water gap, which is eroded across the 410-foot high metamorphic rock ridge known locally as Rebel Hill, which forms the Matsonford through valley northern boundary. Metamorphic bedrock hills found south of the Matsonford through valley rise slightly higher to elevations exceeding 450 feet. Figure 4: Topographic map illustrating the east-northeast oriented Gulph Creek valley upstream from the “Gulph” or the Gulph Creek water gap (location 1), the “Gulph” or the Gulph Creek water gap (location 2), the Matsonford through valley (location 3), the east-northeast jog in the otherwise southeast oriented Schuylkill River (location 4), and the Gulph Creek mouth (location 5). Click on map to enlarge. Prior to southeast oriented Schuylkill River valley headward erosion immense west-southwest oriented flood flow moved across the entire region on a topographic surface at least as high as the highest present day regional ridges and hills. A west-southwest oriented channel along the Matsonford through valley alignment probably developed as floodwaters eroded the east-northeast oriented limestone bedrock floor bounded by more erosion resistant metamorphic on both sides. This west-southwest oriented channel was shallow because further west-southwest the limestone bedrock ends and the depth of erosion would have been controlled by erosion resistant bedrock now found on the present Schuylkill-Delaware River drainage divide. Headward erosion of what may have been a 200-foot or deeper southeast oriented Schuylkill River valley to the Spring Mill area (at the east-northeast end of the Schuylkill River jog seen in figure 4) beheaded and reversed flood flow in this shallow and low gradient west-southwest oriented flood flow channel. The reversal of flow in this former west-southwest oriented flood flow channel captured west-southwest oriented floodwaters moving in yet to be beheaded flood flow channels located north and west of the actively eroding Schuylkill River valley head. The capture of flood flow from yet to be beheaded west-southwest oriented flood flow channels further to the north and west resulted in south and southeast oriented flow from the north into the now east-northeast oriented channel leading to the actively eroding Schuylkill River valley head and the development of southeast and south oriented channels leading to the newly reversed flood flow channel. Volumes of flood water from the north and west entering the newly reversed flood flow channel and then moving to the actively eroding Schuylkill River valley head were great enough to cause the 200-foot plus deep Schuylkill River valley head to erode headward in a west-southwest direction along the newly reversed flood flow channel along the route now used by the east-northeast oriented Schuylkill River jog and then along the Matsonford through valley alignment past the present day Gulph Creek water gap south entrance. Floodwaters spilling from the north spilled into this newly eroded and deepening east-northeast oriented valley and became concentrated along several flow routes that eroded deep south oriented valleys headward from the deepening east-northeast oriented channel. For purposes of this essay the two most important of these south oriented flood flow carved valleys was one on the present day Schuylkill River valley alignment upstream from West Conshohocken and a second on the Gulph Creek water gap alignment, although a third such south oriented flood water carved valley is now a wind gap used by the Schuylkill Expressway to cross the ridge north of the Matsonford through valley. Figure 5: Map illustrates the Gulph Creek east-northeast channel location downstream from the Gulph Creek water gap (location 1), the Gulph Creek water gap (location 2), the Matsonford through valley (location 3), the erosion resistant metamorphic bedrock ridge between the Matsonford through valley and the downstream Gulph Creek east-northeast channel known as Rebel Hill (location 4), the wind gap in that high ridge now used by the Schuylkill Expressway (location 5), and the southeast oriented Schuylkill River valley alignment upstream from its east-northeast jog (location 6). 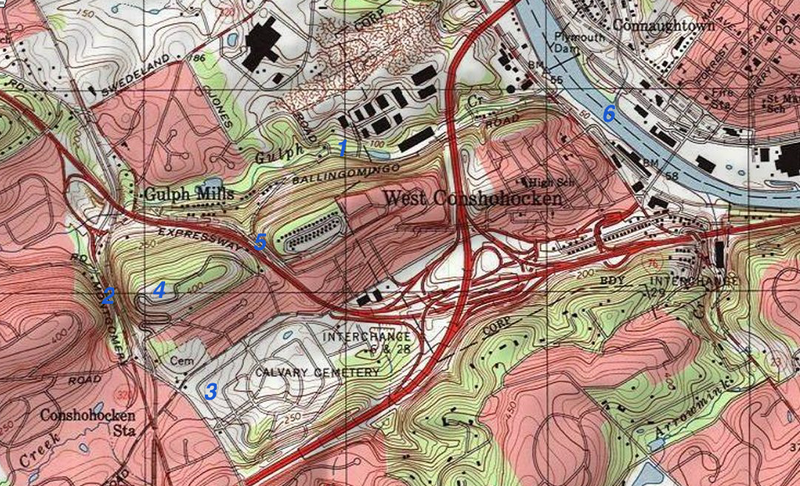 Note, Conshohocken Station on the Norristown high Speed Line in the map southwest corner has been renamed as the Matsonford Station. Click on map to enlarge. The high-level west-southwest oriented flood flow channel north of the present day Rebel Hill ridge before being beheaded and reversed by present day Schuylkill River valley headward erosion supplied large volumes of water to the south oriented Gulph Creek water gap that after passing through the gap turned to flow in an east-northeast direction on the Matsonford through valley alignment to reach the deep southeast oriented Schuylkill River valley. Headward erosion along this route not only deepened the Gulph Creek water gap channel, but also deepened the west-southwest oriented channel north of the Rebel Hill ridge with the result that the Rebel Hill ridge began to be defined by deep channels on either side. Captured south oriented flood flow from still further north moved directly to the Gulph Creek water gap channel and helped to erode that valley deeper than the channel further to east now used by the Schuylkill Expressway. This deepening of the south oriented Gulph Creek water gap channel helped to keep west-southwest oriented flood flow moving towards it while a valley was being eroded headward still further east on the present day southeast oriented Schuylkill River alignment. Eventually west-southwest oriented flood flow moving in the channel north of the Rebel Hill ridge to the Gulf Creek water gap was beheaded and reversed by headward erosion of the present day deep southeast oriented Schuylkill River valley north from West Conshohocken. Reversal of flow in this northern limestone floored valley also reversed flow moving through what is now the Gulf Creek water gap and also captured east-northeast oriented floodwaters coming from west of the Matsonford through valley (that water was spilling into the deepened east-northeast oriented from high-level and yet to be beheaded west-southwest oriented flood flow channels in the present day Chester Valley area–those high level flood flow channels had to be at elevations greater than 550 feet) . This capture created the present day Gulph Creek east-northeast, north, and east-northeast route to the Schuylkill River. Because the route north of the Rebel Hill ridge had the advantage of still being able to capture yet to be beheaded flood flow from north and west of the actively eroding Schuylkill River valley head it was able to erode a somewhat deeper valley and eventually became the primary and deeper flow route with the result that direct east-northeast oriented flow to the Schuylkill River using the Matsonford through valley alignment ceased. Soon thereafter Schuylkill Valley headward erosion beheaded all west-southwest flood flow routes that had been captured by the deeper reversed flood flow routes in the present day Gulph Creek drainage basin and floodwaters could no longer reach the present day Gulph Creek drainage basin, which remained almost unchanged until the time of human highway construction. Discussion: Published geomorphology landscape development hypotheses and models fail to explain the Gulph Creek drainage basin landforms such as the Strafford through valley, the Gulph Creek water gap, and the Matsonford through valley and for that reason those hypotheses and models are not discussed here. Instead a completely new hypothesis is presented. The new hypothesis requires immense west-southwest oriented floods to have eroded southeast Pennsylvania valleys in logical sequences and can be tested to determine if landform evidence such as barbed tributaries, water and wind gaps, and valley orientations support the predicted sequences. The source of the immense flood flow cannot be determined from the southeast Pennsylvania evidence and can only be determined by tracing flood flow evidence headward to a flood flow source. Preliminary research suggests the flood flow source may have been a melting continental ice sheet that produced immense southwest oriented floods that flowed along the North American east coast prior to present day river valley erosion. Why the water did not move directly to the Atlantic is unknown, although it is possible the ice sheet weight caused buckling of the continent that lowered the center and raised non-glaciated coastal areas. Whatever the reason for the southwest oriented flood flow present day river valleys draining from the Appalachians appear to have eroded headward from the Atlantic Ocean in sequence from the south to the north, which is confirmed by detailed Gulph Creek drainage basin evidence where southeast oriented Darby Creek valley headward erosion occurred prior to and was ended by Schuylkill River valley headward erosion.